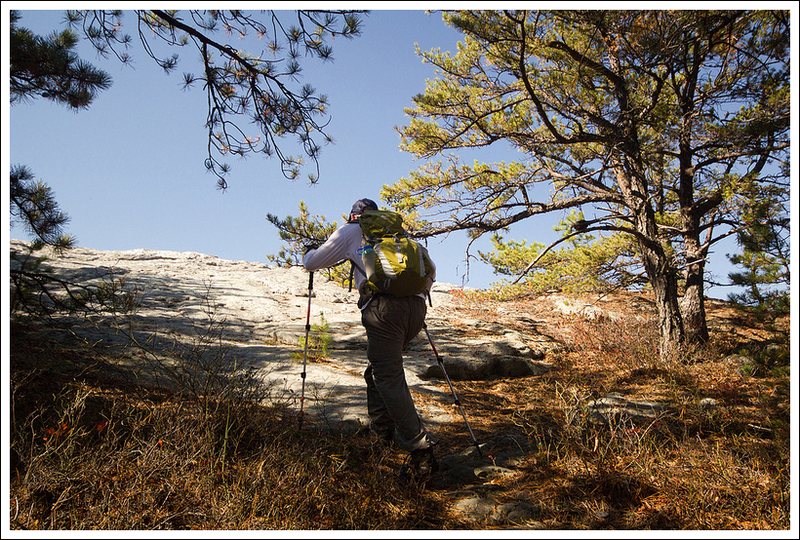 This 6-mile hike is a bit challenging – tough climbing and a little hard to follow – but payoffs at the end make the effort well worth your while. 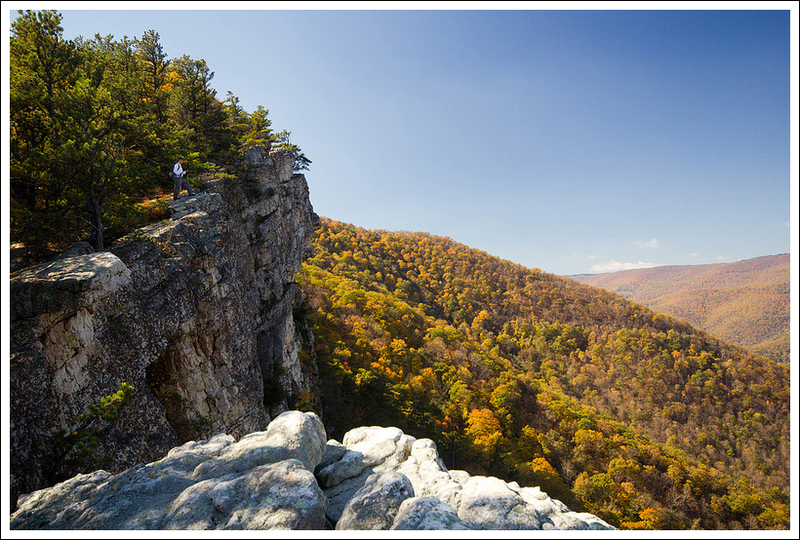 The views are spectacular – some of the best in the mid-Atlantic! Amazing views from Chimney Top! Below: Adam checks out the trail information board; The spine of the mountain offers many magnificent views, if you’re willing to do a little climbing. Our first experience hiking on North Fork Mountain was on my birthday in 2012 (birthday hikes are a tradition for us!) 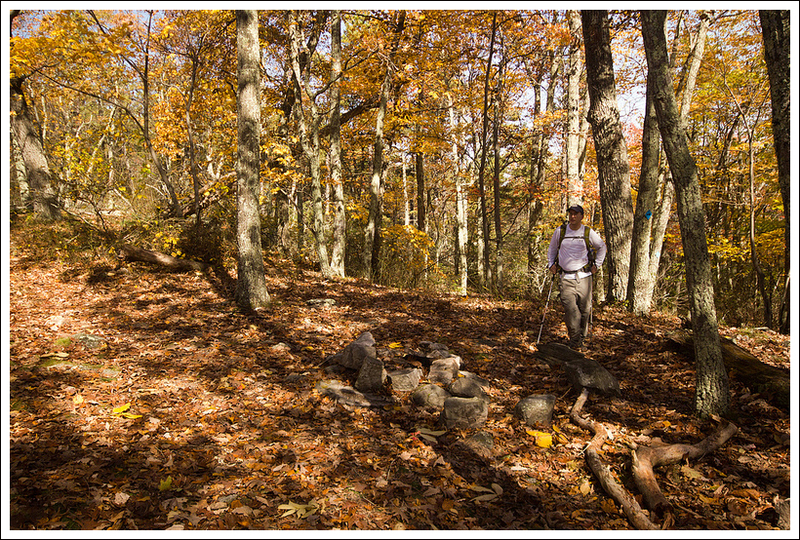 We decided tackle a little piece of the the trail from the base of the mountain to the well-known outcropping of Chimney Top. This August day ended up being one of the hottest days of the year. While hiking up the backside of this mountain, there was absolutely no breeze so the air was stifling. We were quickly questioning why we chose this one, but we had to press on for tradition’s sake. We reached the ridgeline and walked along for a while. We eventually came across a few rocks that seemed to denote a path up. We semi-bushwhacked up this trail and came to a rock column and climbed up to the top to enjoy the views. We thought this may have been Chimney Top. When we got back home and did more research, we realized we hadn’t found the true Chimney Top, so we vowed to return – and we did… on our sixteenth wedding anniversary in fall 2013. It was a perfect October day with the leaves just a shade past peak. One of the difficulties about this trail is there are no solid online resources for maps and even using our mapping software (alltrails.com), the full trail doesn’t appear on any kind of topo maps. We used our MapMyHike app on our phones to try and get accurate readings and I traced that outline on a topo map through alltrails.com to try and get a good resource if you want to attempt this hike. We arrived at the small parking area and made our way up the trail. The trail meanders for the first two miles through the woods with some slow switchbacks to help you gain elevation. The thick canopy is high above you, but you will notice you will rarely feel much wind on this side of the mountain. Around 1.5 miles, you make a steeper ascent up the mountain and reach the top of the ridgeline around 2.0 miles. Once you reach the top, you can see down below to the North Fork of the South Branch of the Potomac River and WV-28/55 on the other side. Both times we have been, you can see dots of people fishing in the river. Across the way, you will see ridges of mountains with Canaan Valley hidden behind them. 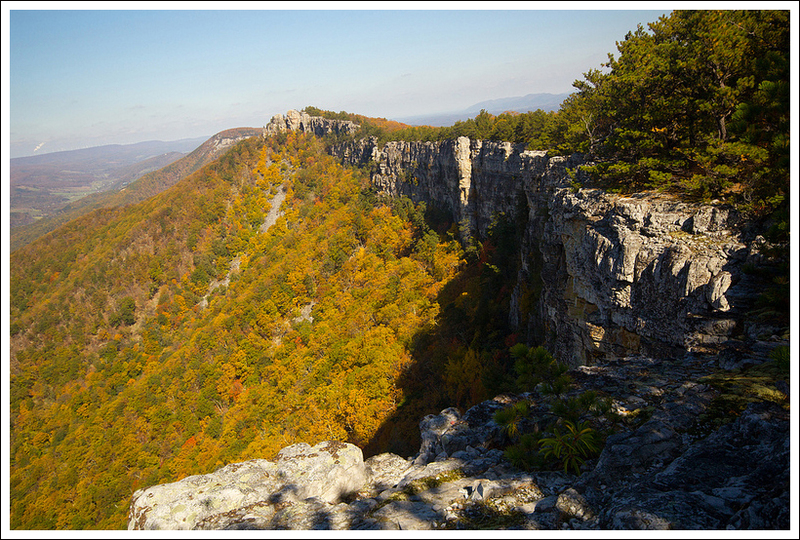 Looking along the ridgeline, you’ll see sheer cliffs of rock, making this quite a remarkable scene. From this ridgeline, we continued along the path. The trail stays on the ridgeline allowing for several opportunities to check out the views for the next .5 mile. Around 2.5 miles, the trail has been rerouted away from the ridgeline and you descend the mountain. The signs say that it was to protect the nesting/hatching peregrine falcons, who have nested on the cliff faces. The signs are at least five years old, and October is not nesting season, so we’re not sure if the signs are still valid. Fall color was pretty nice! Below: The trail is often rocky and rough; Adam walks along the increasingly hidden trail. The trail continues through this terrain for another .5 miles and then starts to gain elevation again. At 3.0 miles, we came to a well-established campsite and could see the ridgeline just above it. I walked over to the ridge, but the views were fairly obstructed. I then saw a smaller campsite to the right of the trail. 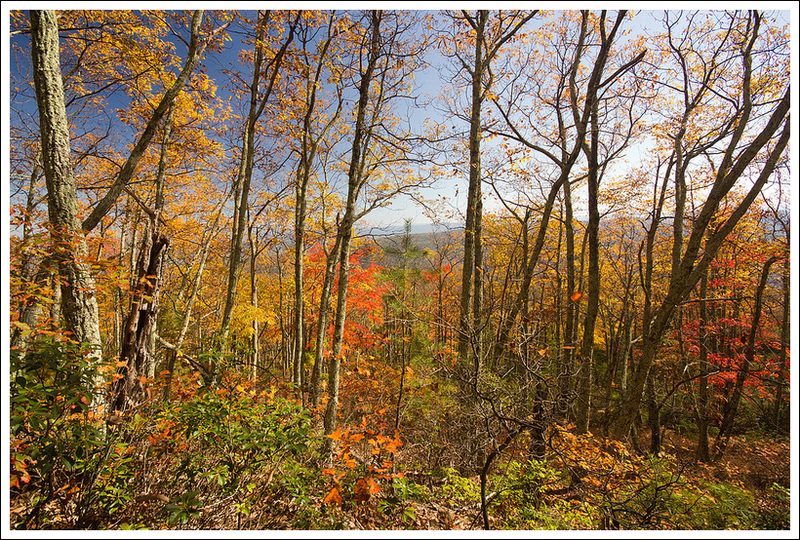 Going to that campsite, I walked a short distance behind it on a small trail towards the ridgeline to discover the elusive Chimney Top. The photos we will place should lead you to the proper campsite that leads to the correct trail. We ate some lunch from the top of the cliffs near Chimney Top Exploring a little around this area, you are able to see a most-impressive cliff face (where I’m assuming is the section protected for peregrine falcons). After we ate our lunches and took in the scenery, I decided I wanted to try to climb up Chimney Top. I had to find some good footholds, but I was able to get up without too much trouble, but please be careful if you try to do the same. There are many sheer drops from here, so I wouldn’t advise any unsupervised children to be given free reign on this hike. Head back the way you came to make this a 6 mile out-and-back. 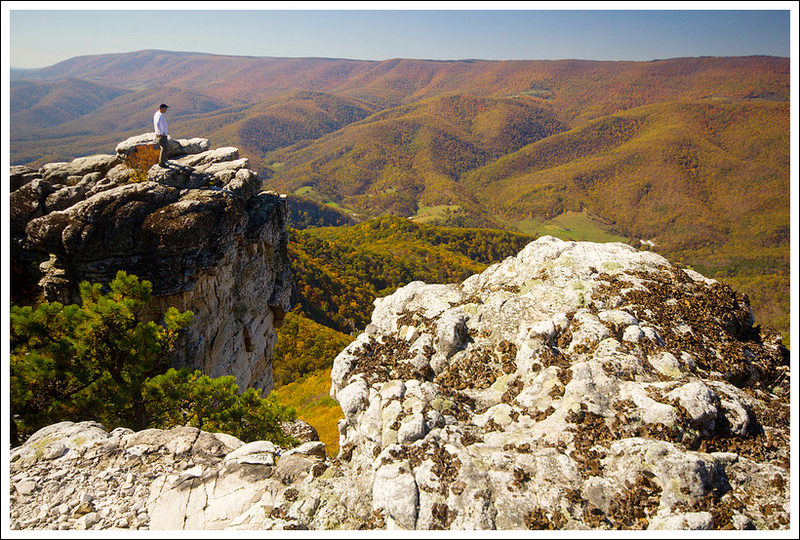 I do believe that the scenery from this spot is one of the most dramatic and beautiful views you will get in Virginia and West Virginia. The trail was called the best trail in West Virginia by Outside magazine in 1996 and I can see why. Some people like to backpack the entire 34 miles of North Fork Mountain. Since you are at the top of the ridgeline for this hike, there isn’t a reliable water source to be found so you would need to pack in a lot of water for this backpacking trip. 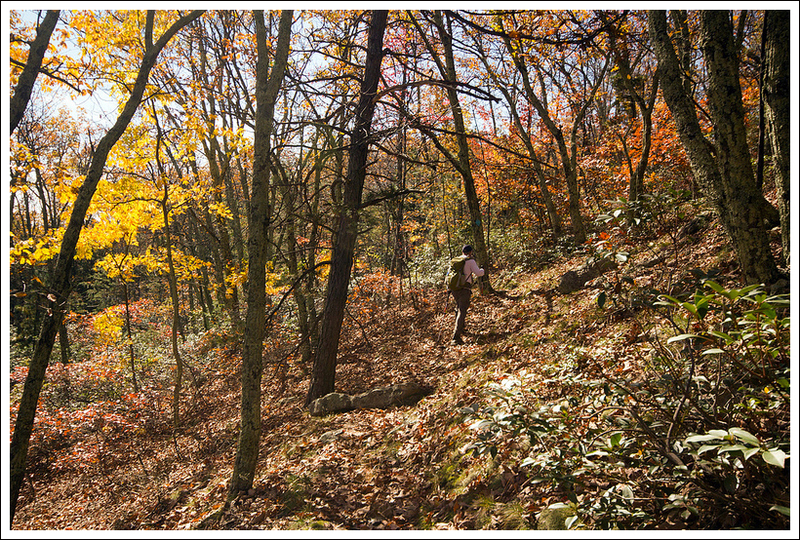 I would strongly recommend trying this hike on a beautiful spring or fall day. I’ll admit – I’m the reason it’s taken over three months to get this hike posted. A foot injury, a lingering cold, and the unusually frigid temperatures have sent me into a state of lassitude. I haven’t felt particularly motivated to hike or write. I’m sure I’ll snap out of it completely sooner or later. But today, I decided to give myself a little push and get this post live! Fall foliage and amazing views. Below: Adam checks out one of the campsites; A nice view of the cliff face along the mountainside. We were really excited to try this hike again. Our trip on Adam’s birthday had been rewarding even though we missed out on the main view. We started the morning with a big breakfast at Bright Morning Inn (Pumpkin Pancakes with Walnuts and Maple Butter Sauce!). It’s one of our favorite places to eat in Canaan Valley/Davis – everything is always excellent there! After parking, we started climbing the mountain, following the familiar ground we had covered the previous summer. We spent a little time exploring the first of several impressive rock outcroppings on this hike. While there, we took some time to chat with the only other two people we saw on the trail – a couple from Pennsylvania. They were recent empty-nesters and were returning to backpacking for the first time in 20+ years. They still had all their gear from the late 80’s/early 90’s – external frame packs, old fashioned sleeping pads, and I think I may have seen something cast iron! It looked like a heavy load! After leaving the first view, we pushed along the trail, passing the spur trail to our lunch spot from the 2012 attempt. This spot is marked by a rock cairn and the worn footpath is well established. I thought this rock formation near Chimney Top looked like a tortoise. Below: More views; Adam checking out another rock outcropping along the way. The route follows a series of rolling hills after passing the spur trail. I thought the trail was pretty hard to follow along this section. It’s a reroute, and vestiges of the old trail are still apparent. It may have been because the trail was under so many leaves, but I still think the reroute isn’t fully established. As we continued along, I asked Adam how much further we should go. According to old information, we had hiked far enough to be well past Chimney Top. As it turns out, the reroute is just longer and follows a wide arc around the preserved cliff face. Eventually, we reached a spot with numerous campsites. That’s usually a good indicator that you’re near something desirable to hikers/campers. In this case, spotting the campsites let us find yet another unmarked trail that led out to the spectacular view from Chimney Top. 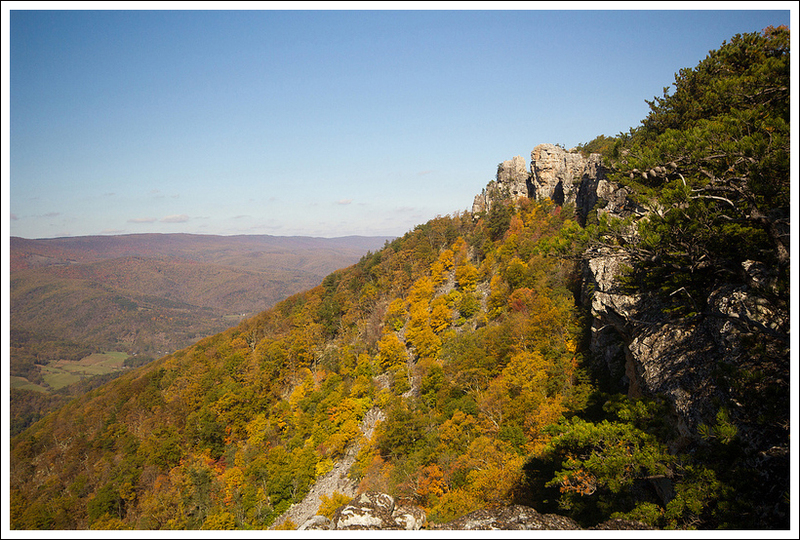 We spent quite a while up there, enjoying the fall foliage and awesome views, eating our lunch and taking photos. The hike back went very quickly… mostly downhill and along a route that felt a little more familiar. Elevation Change – 1725 ft. Difficulty – 3.5. The trail has some decent climbing on it. Both times we’ve hiked it, there wasn’t any wind until the top, so the temperatures can be stifling. Trail Conditions – 1.5. Trails are largely unmarked with reroutes not always clear. 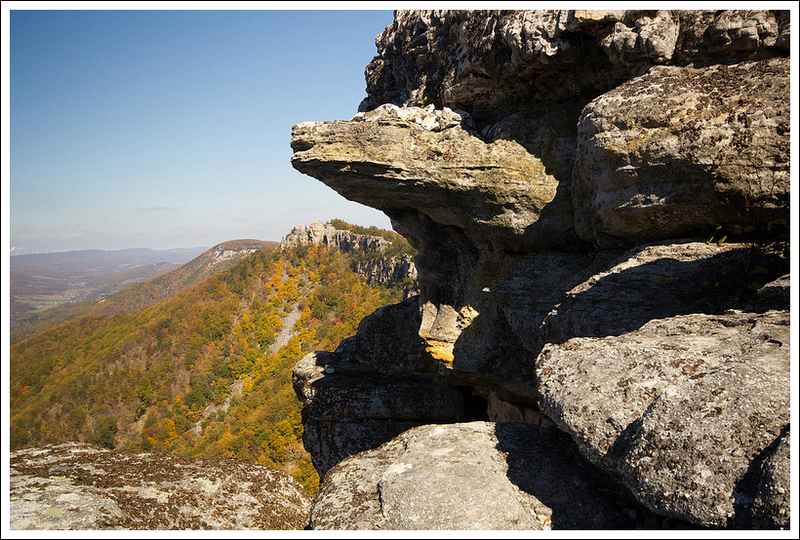 Finding the actual viewpoint of Chimney Top can be a little challenging. Watch out for loose rock on the ridgelines in case you go to check out any views. Views – 5. Absolutely stunning views and great ridgeline walking. Streams/Waterfalls – 1. From way above, you’ll see North Fork Gap. There isn’t a water source on this trail. Wildlife – 1. We barely saw squirrels, but you may have some views of preying birds. Watch out for timber rattlesnakes on the rocky ridgeline. Ease to Navigate – 2.5. 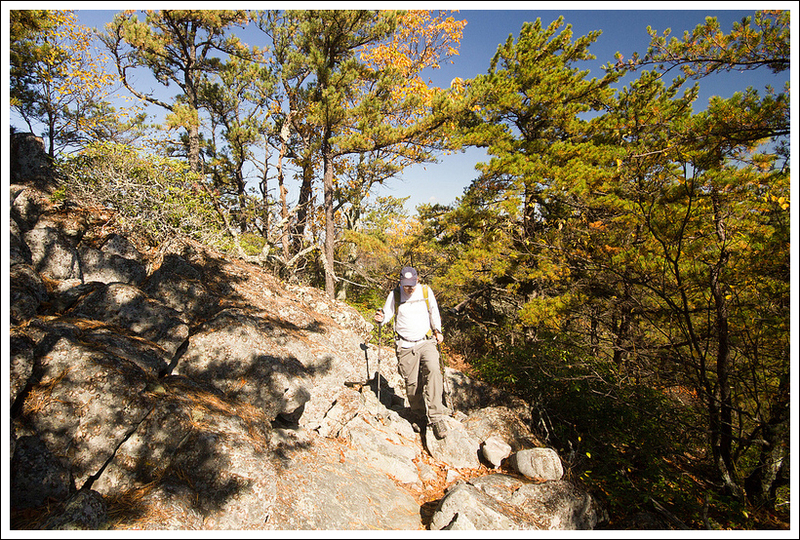 There is basically one trail to follow here, but it can be tricky finding Chimney Top. Solitude – 4.5. Typically, you’ll only see a few people on this trail. Most will go to the first overlook and stop. 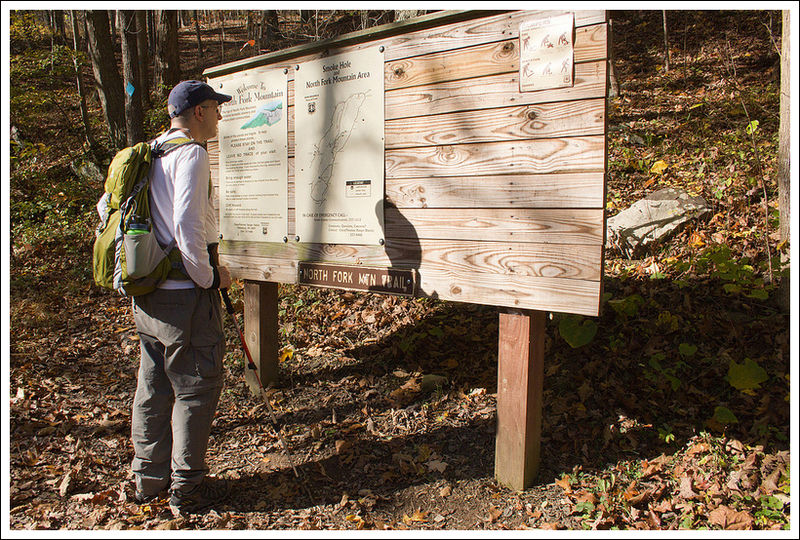 Directions to trailhead: From Seneca Rocks, WV head northeast on WV-28N/WV-55E for 15.2 miles. Take a right on to County Route 28/11/Smoke Hole Road. You immediately cross a bridge where you may see people fishing in the stream. In about .4 miles, there is a small parking lot on the right-hand side. You’ll see the brown board which denotes the start of the trailhead. I agree when I lived in Pittsburgh every year we would make the trip down.this is one of the best hikes in the east. Right up there with the shining rock wilderness NC and mt. Katahdin in maine. We found it about 15 years ago . You could see the chimney top on the highway below. It is the high point on the north end of the mountain. Thanks, Bryce! I’d love to do the full hike as a shuttle, but always worry about running out of water up there! Fantastic! 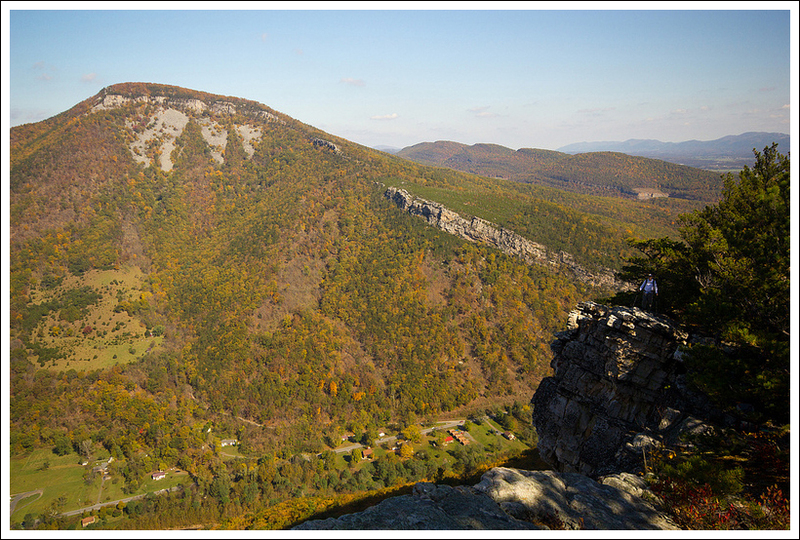 North Fork Mountain and Chimney Rock are both such beautiful places offering some fabulous views of my state! You did a wonderful job capturing and documenting your journey! Thank you so much for sharing it! Thanks for the visit, Todd! We love West Virginia! My most favorite place in WV…if you can carry enough water, nothing beats spending the night on that wonderful mountain! Thanks for another awesome write up! Thanks for the visit, Jim! A hike I haven’t done and know little about – thanks for the description and the always spectacular photos! I will have to add it to the list. How long a drive is it from Harrisonburg? And Google routes me through Broadway and up Rt 259 rather than west on U.S. 33. What is your recommendation? 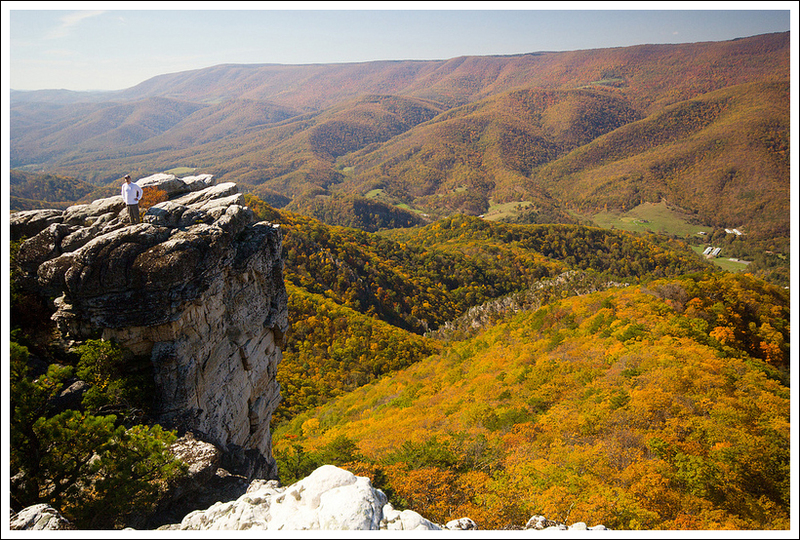 I always want to do an Autumn hike in WV, but seem to think about it when the calendar is already past peak there. Maybe I’ll circle the first weekend in October for 2014 as a reminder. Glad I’m not alone in the doldrums! I like winter and snow… but this bitter cold is something different. We always take 33 and we usually make a whole weekend of it since the drive is so long. 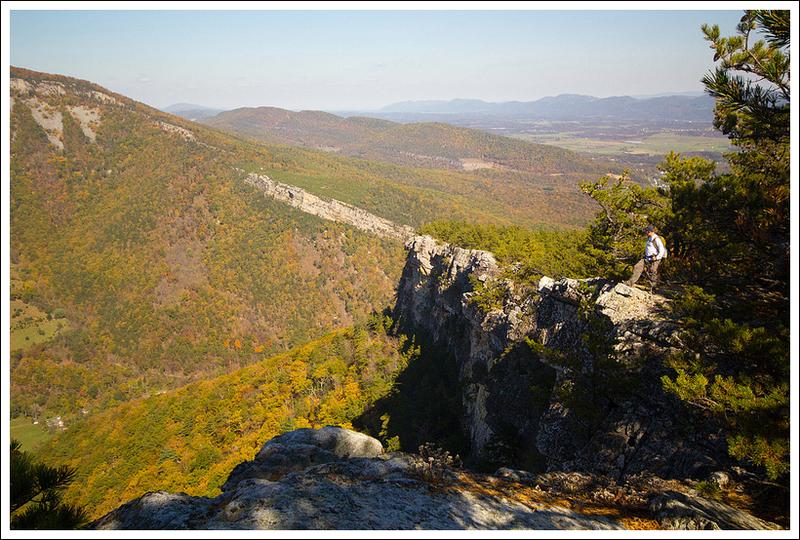 There is a lot to see/do in Dolly Sods and Canaan Valley. North Fork Mountain is pretty conveniently located to both of those places. Great shots of some lovely scenery…Pumpkin Pancakes with walnuts and maple Butter Sauce!… now where was I…ah yes, lovely scenery, well worth the wait.